Our Boat and PWC (Personal Watercraft) body shop does it all with a long list of services aimed at improving and restoring the condition of your watercraft. Please take note that our facility allows for a complete boat lift, so your machines will never be turned on its side or flipped upside down..
Has your boat experienced fading? 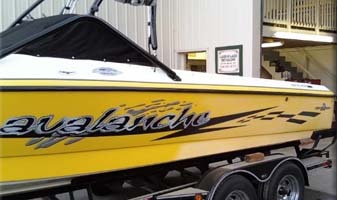 Does it have light scratches or dock rash on the sides of the boat that you’re tired of looking at? 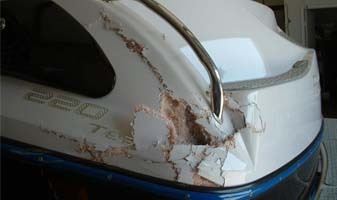 Our boat scratch removal service is a lot quicker and easier than you think. 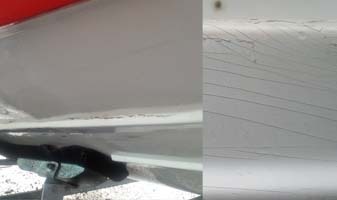 Gelcoat is made up of layers; these marks will easily come out without having to re-spray the boat with new Gelcoat. We repair anything from fibreglass gouges to holes in your watercraft. 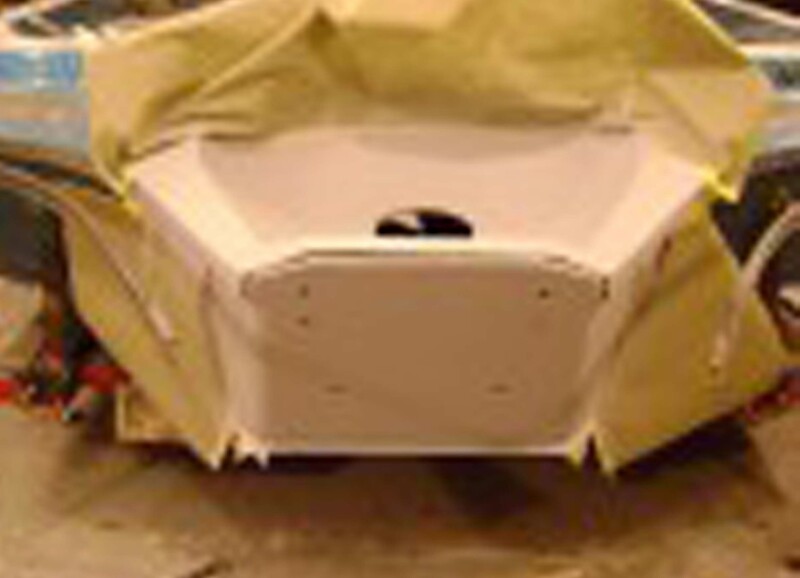 We will promise 100% satisfaction that any fibreglass issues is repaired correctly, thus restoring your boat to factory condition. 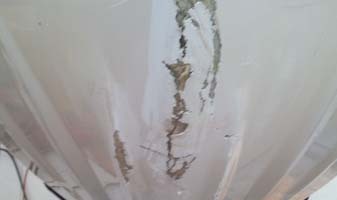 Osmosis and stress cracks are both serious issues, especially if you are experiencing either one of these issues on the hull of your watercraft. 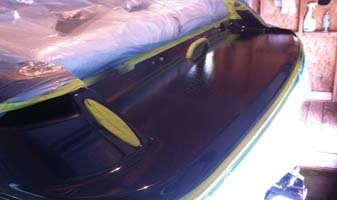 If left untreated, osmosis will slowly add more moisture into your hull which will weaken you gelcoat and peel off. In turn, stress cracks will continue to expand until they weaken an entire section of your watercraft. Both are visually unappealing, but more importantly both are significantly damaging to the long-term health of your Boat or PWC. Northern Lakes Boat Works facility is 100% authorized by your insurer. We are a one stop shop in that our services include body repair, re-upholstery and rentals. Give us a call if you have an insurance claim, we will happy to provide you with a premium rental boat while yours is being repaired and restored to factory condition. While obviously an unfortunate situation, Northern Lakes has the facilities to restore your watercraft to a like new state. Structural repairs are by far the most important of any services that we offer. These repairs involve the overall safety of a vessel. For that reason we 100% guarantee this work. That is why you need to look no further if you need to have your boats transom repaired, floors refurbished or any other issue affecting the overall durability of your boat or personal watercraft. We work with any all materials including epoxy, plastic, Kevlar & fibreglass. Looking for a new boat? NO NEED. We make yours look like new for much less than you think. We can assure you that refinishing your watercraft to a like new state is a lot less costly than replacing the Boat or PWC altogether. See our portfolio section to have an idea of the extent that we can do. 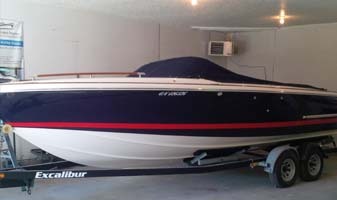 Our boat body shop has experience with all makes & models. Our aim is to serve our region better so if you’re on Lake Muskoka, Lake Rosseau, Lake Joseph, Lake Simcoe or Lake Couchiching and need body work completed on your boat or personal watercraft, then Contact Us Today! Please provide your contact information and a condition overview of your watercraft. One of our representatives will surely get back to you! Providing us with images of the areas that need to be repaired will allow us to provide you with a more accurate quote. Please upload your photos below.